The decision to have your water treated depends on a variety of factors. But the first indication that something isn’t right with tap water quality is highly sensory. There are more tricky things to worry about when it comes to water treatments, but here is our plumber‘s simple first test. Appearance – Chemical or mineral impurities commonly found in the Puget Sound such as iron, magnesium and copper, can result in discolored water which leaves noticeable marks throughout our environment. Trust John’s Plumbing & Pumps expertise for the right treatment to eliminate your unsightly water problems. Sound – A constant drip is more than an annoyance. The drip of untreated water will leave behind its mark letting you know how long it has been calling out to be repaired. Taste – Poor tasting water is one of the most common and frustrating problems. If you want to improve the taste of your drinking and cooking water, you can trust John’s to provide the best water treatment units on the market. 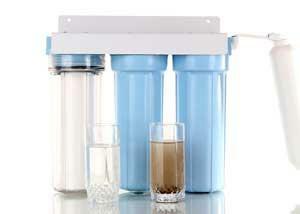 John’s advanced water filtration and reverse osmosis systems deliver better than bottle-quality water. You will LOVE your water! 100% of our customers say they do! Texture – There are very few things in life less pleasant than living with rough and/or hard water. Calcium, iron and other minerals in hard water can be damaging to your pipes and appliances, and no amount of chemicals, scrubbing or lotions will help your body avoid the effects of hard water. Odor – unpleasant odors in your water can be the most frustrating experience; every time you turn on your water you’re reminder something is very wrong: chlorine, rotten eggs! Chemical or petroleum (gas or oil) type smells or musty, soil or wood smells? Our water treatment systems permanently eliminate these unhealthy, possibly dangerous reminders. We carry the broadest line of residential water treatment products available today; from whole-house solutions to point-of-use systems. We have the technology and expertise to solve your water problem! Which solution is right for your household? To learn more regarding the unique patented residential products solution, click the link below.